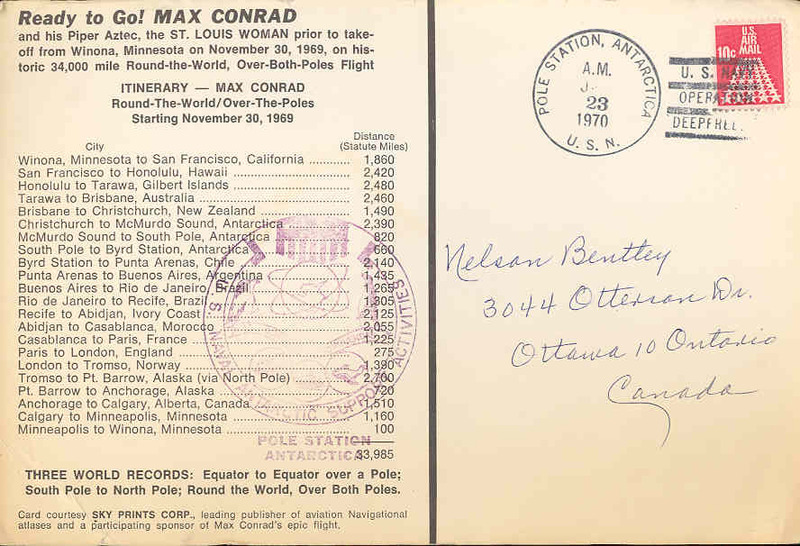 Max Conrad was born in 1903 in Winona, Minnesota, and after Lindbergh's 1927 transatlantic flight he decided to become a pilot. He was already a musician, and the original idea was that it would be much more practical to transport his orchestra by plane instead of by bus. In 1929, shortly after becoming a flight instructor, he was seriously injured after he tried to rescue a passenger who was walking into the spinning propeller. 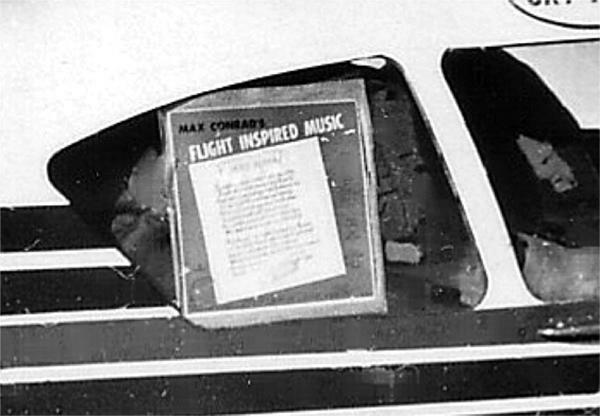 The passenger was killed; Max suffered a fractured skull from which it took years to recover. During this period he used music and singing as mental therapy and to help him regain his speaking voice. He also learned to play at least 7 instruments. 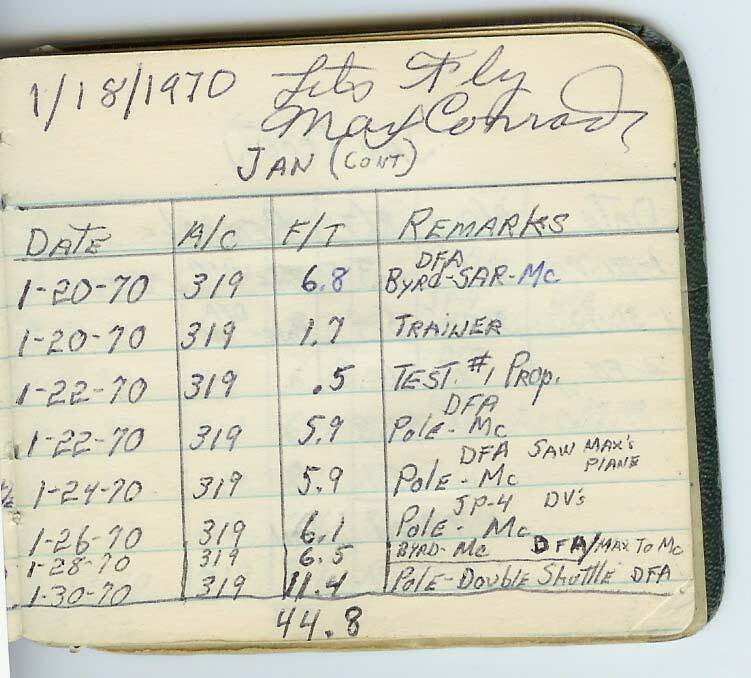 He married in 1931 and slowly reopened his flying school, and as World War II approached he was put in charge of organizing a series of Government flying schools. In 1943 he became the chief pilot for Honeywell in Minneapolis; in 1948 he ventured across the Atlantic in a new Piper Pacer to visit his family which had gone to live in Switzerland. Not a good idea--the aircraft was impounded in Thule where he was thought to be a spy. 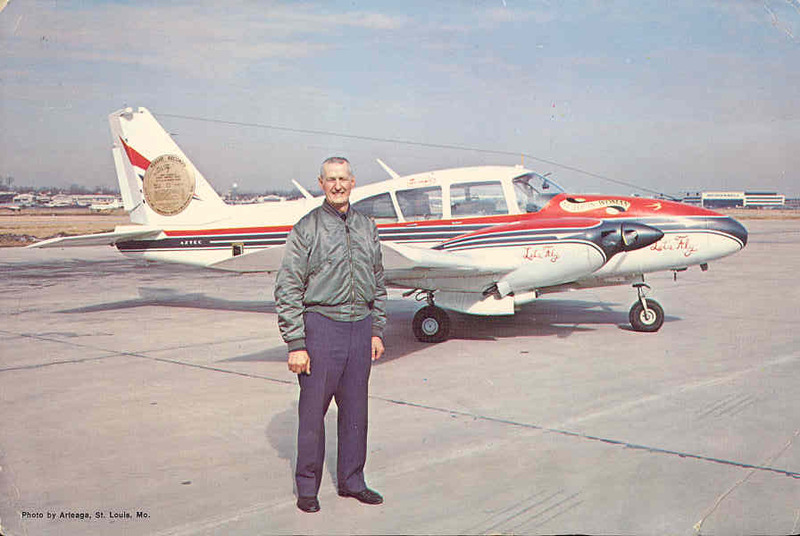 He was freed and rejoined his family, and this venture turned into the start of his lifetime partnership with aircraft manufacturer William Piper. 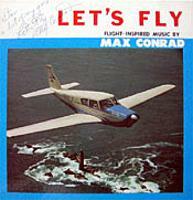 Conrad went to work with Piper as a ferry pilot in 1954. This gave him an opportunity to drum up publicity for the aircraft by making solo long-distance and closed-circuit record-setting flights. These included ventures between Casablanca and El Paso, as well as a duplication of Lindbergh's effort. Meanwhile he retained a passion for encouraging young people to learn to fly. 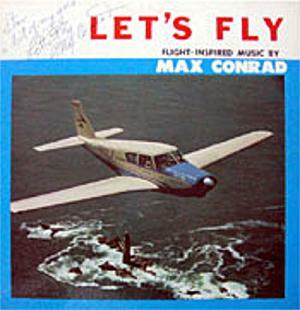 During the 50's he recorded several songs; his trademark tune "Let's Fly" eventually became the title song of his record album (left). 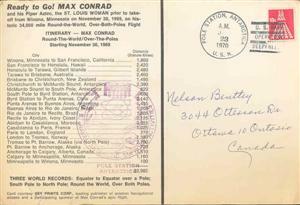 He used the sale of records and sheet music to help finance some of his flights. 1961 brought his first successful round-the-world flight, westbound, in a twin-engine Piper Aztec. 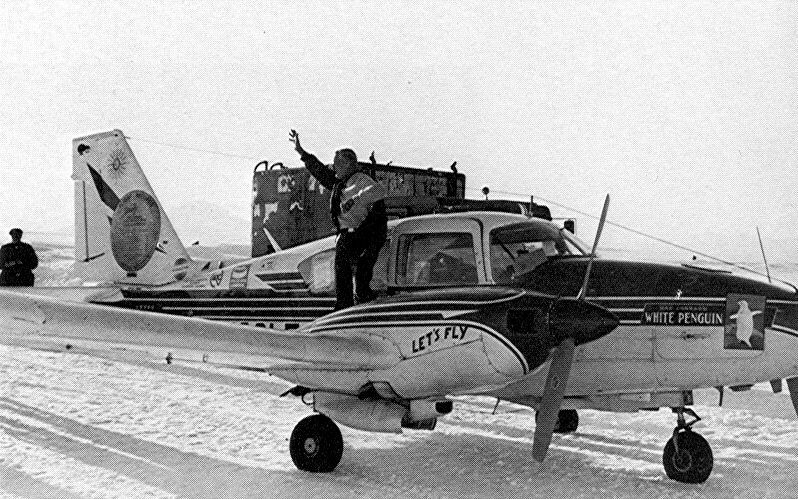 In 1966 he made a second flight around the world, this time eastbound, to promote Expo 67 in Montreal, using a twin-engine Piper Comanche. Max became involved with the Antarctica for the first time in late 1966 when he was hired as a charter pilot for a private group planning the first ascent of Mt. Vinson. 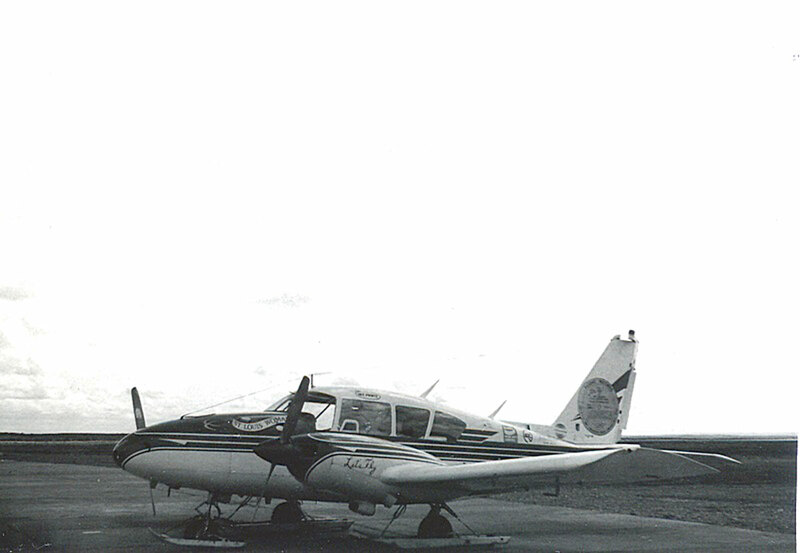 The FAA insisted that he needed a twin-engine "stock" aircraft rather than his single-engine Comanche, so he purchased (with help from Piper) the Aztec which he named named "St. Louis Woman" for one of his daughters. He did make one flight from South America across the Drake Passage to the Ellsworth Mountains, but the venture was then cancelled when the USARP-sponsored expedition had reached the summit. Now Max became interested in going around the world via the Poles. By now he was known as the "flying grandfather" (a term he disliked) because of his 10 children and 26 grandchildren. 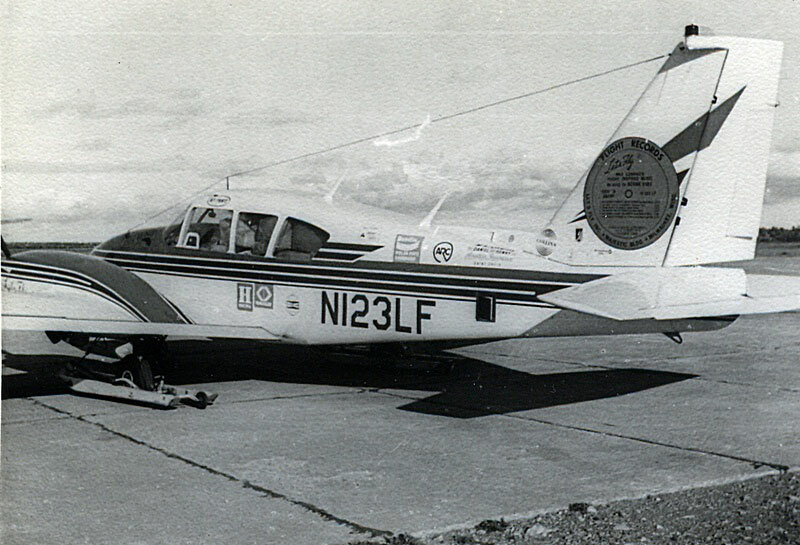 "St. Louis Woman" was extensively modified, fitted with cabin and wing tip tanks giving a total capacity of 476 gallons, and given the registration N123LF--the "LF" standing for his motto "Let's Fly." He obtained official permission from the U. S. Navy for the flight, with a bit of help from fellow Minnesotan (and Vice President) Hubert Humphrey. 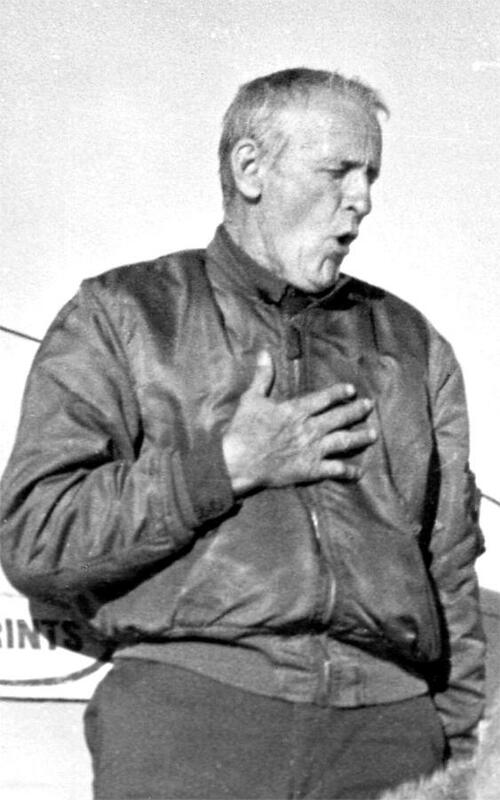 Conrad left St. Louis on 1 November 1968; his route over the North Pole included stops at Barrow and ice station T3 (where he suffered severe frostbite to his hands while deflating his tires to keep them from freezing to the ice). He then flew down across Europe and northwest Africa before crossing the Atlantic for Buenos Aires. Here he installed skis (which he had left here in 1966 after the aborted Mt. 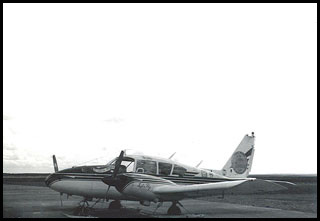 Vinson venture), and continued to Punta Arenas (PA), as seen in the photos below at what was then the Chabunco Airport (now the President Carlos Ibañez del Campo Airport) at PA.
His next leg was to be a nonstop 1000-mile leg to Adelaide (the British station at the south end of that island, near the current Rothera). 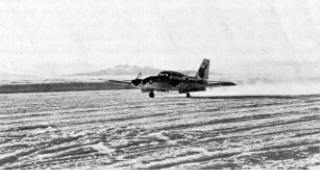 He tried to head south on 15 December, but he turned around at a reported latitude of 65°-15'S, after he had descended to a low altitude in fog and rain. 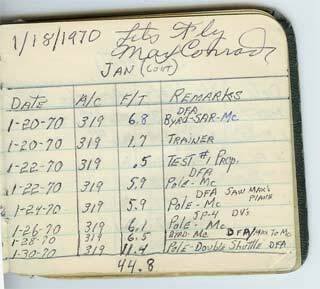 On 21 December he left PA again and landed at Palmer after a 9-plus hour flight. Here he was aided by crew members of the Coast Guard icebreaker Edisto in repairing one of his landing gear wheel assemblies, which had been damaged on landing. 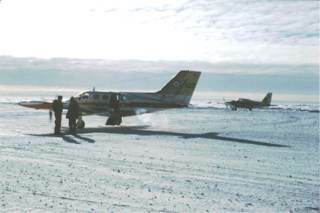 He refueled and was on station for 2 days before continuing to Adelaide (photo at right just before his departure from Palmer). The next stop was to be Byrd Station, but after remaining at Adelaide for several weeks, he turned around and headed north to Deception Island to remove the skis. From there he returned to PA on 15 January. 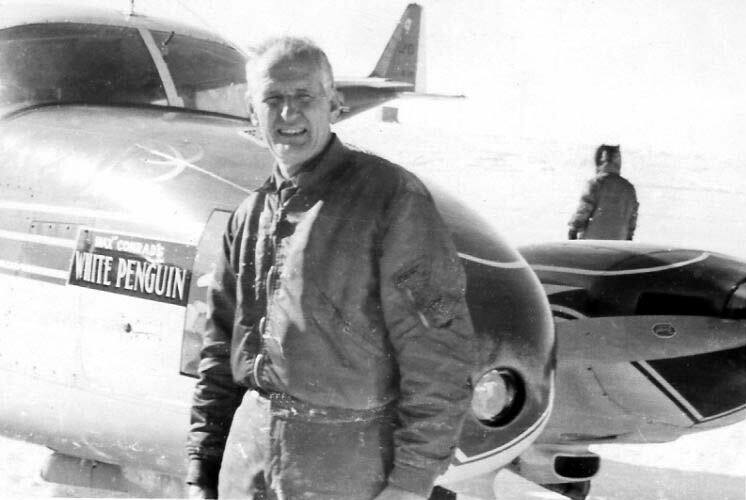 His reported reasons for aborting the mission included "several mechanical problems plus the doubtful performance of my overloaded aircraft on skis and my lack of antarctic knowledge," according to the Associated Press. Another reason was the lack of 100-octane aviation gasoline along his route. He claimed that he needed the 100-octane fuel in order to fly with skis (which significantly increased wind resistance in flight), and the skis were a U. S. Navy requirement for landing at Byrd or Pole. Still, he said that his aircraft had performed well, and that he was considering another attempt the following season via New Zealand. 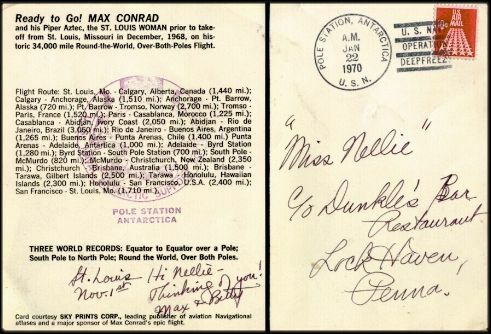 Above is Max's expedition postcard for the 1968 attempt. Max had 5000 of these printed up and sold for $2 each before this first flight. 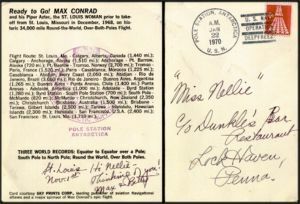 Eventually he brought them to Pole on his second try; this card was cancelled the day before the crash (here is an overenlarged view of the back of the card showing the itinerary and cancellation). Before preparing for his second trip, Conrad had long negotiations with the U. S. Navy, which didn't want him to go again. 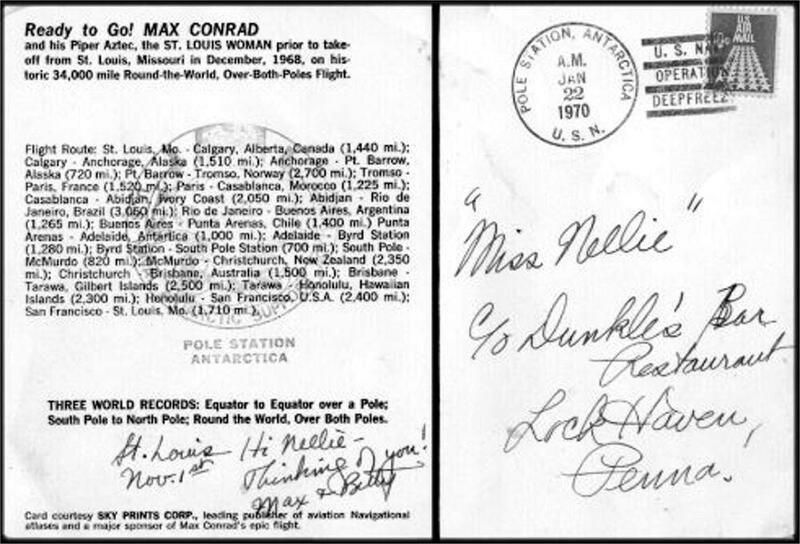 But thanks to the intervention of Senator Barry Goldwater, Conrad was given permission to land at Pole. 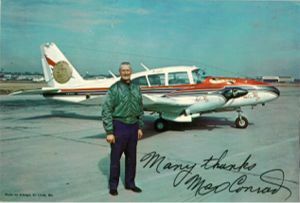 He had a new itinerary, he renamed the aircraft "White Penguin," and he presold a new $2 postcard (below) although it carried the aircraft photo from the previous year. The itinerary was altered to include a couple of extra stops for engine repairs, but he made it to Christchurch in early January 1970. From there he headed to Invercargill, from where he left for McMurdo escorted by VXE-6. The first time he was forced to turn around when one of his engines lost oil pressure. 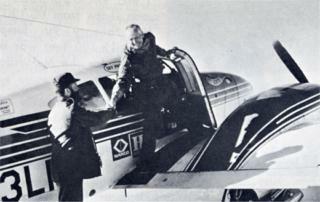 After an overhaul, he tried again on 12 January, landing at Williams Field around midnight--with a flat tire (below left). "So he came to Christchurch, was living in his airplane and we invited him to stay with us. 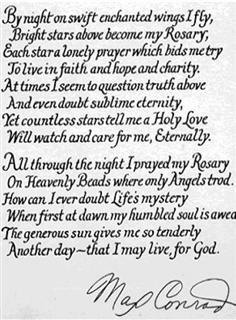 And it so happened that Mary [Kelly's wife] was a classmate of his niece. And had met him before. So he came out and stayed with us. And eventually he flew to McMurdo and we flew the C130 along and gave him steering instructions. Said come left or come right and so forth. And we did the same thing on his way from McMurdo to South Pole. And he landed at the South Pole. He got there with his aircraft. But when he took off he crashed at the South Pole. He was going back to the Antarctic Peninsula. How he was going to get there I don't know because he had instrumentation on his aircraft but he couldn't use it. 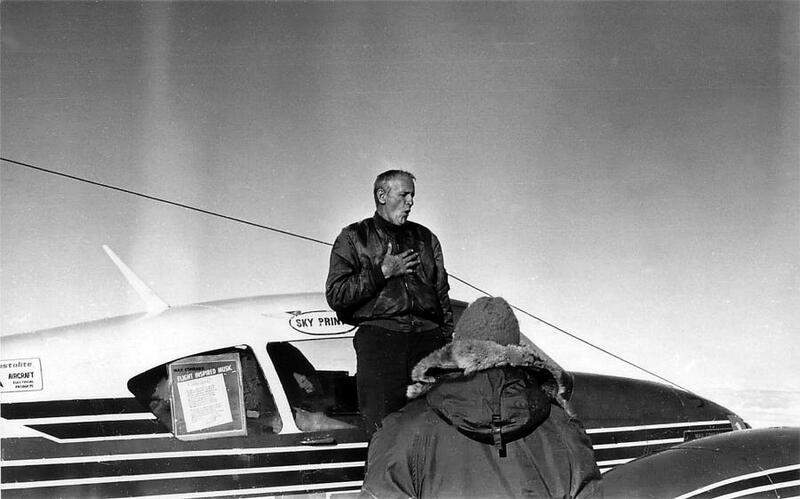 He didn't know how to use it..."
Well, as things turned out, Max never had to navigate from Pole to South America, but with all those solo flying records one would think he had learned something about flying. One of the Pole crew asked Max what he used for a map, and he pulled out a small world globe that he carried in the aircraft. He later said that he had trouble with his navigational gear because of the cold, and "could not get navigational bearings at times, because cloud covered all features except for the mountain peaks" (hmmm, what mountain peaks are near Pole?) At one point he was unsure of his course for 2 hours. 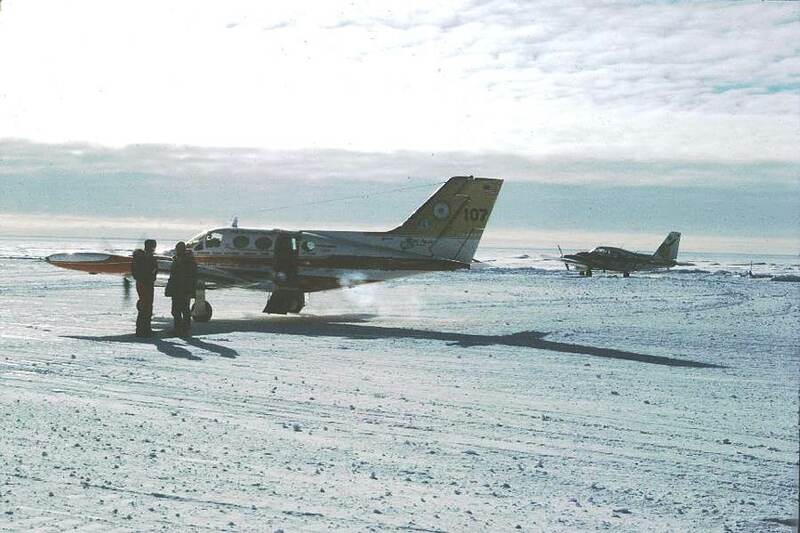 In any case, he made it to Pole on 19 January 1970 after the 5-1/2 hour flight from McMurdo, twelve hours before the Flying Vikings show up in their Cessna (photo at left from Bob Hutt; Max's plane is the one in the background). The Norwegians went back to McMurdo in a few hours, but Max stayed at Pole preparing for the next difficult leg to South America. What happened next? Here Max is at Pole. Yes, he's singing. Not exactly wearing ECW, wonder how his voice is holding up. What was he singing? I don't know, but here's a video of the title song "Let's Fly" from that album, which is still out there on used record sites. 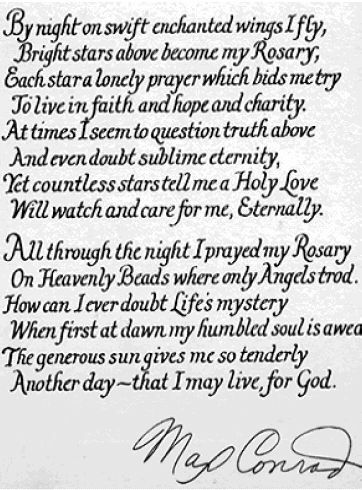 At left is an enlargement of the cabin window, and at right is another, more readable version of what is in the window--a sonnet which he developed during his long hours aloft. Fortunately the Good Lord smiled upon Max later in the day, as he escaped injury in the mishap. 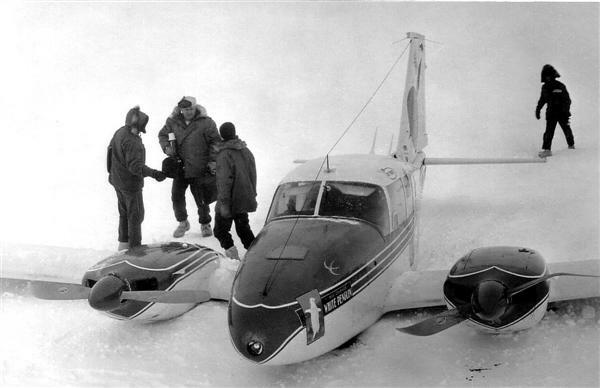 Another photo of Max in front of the White Penguin shortly before the crash; note the VXE-6 aircraft in the background.